Dodger Stadium, privately built by Walter O’Malley, opened in Los Angeles on April 10, 1962. It was immediately known for its beauty, family-friendly atmosphere, affordable tickets, colors, parking, cleanliness, unparalleled sightlines and protected environment. O’Malley was involved in every detail of the planning and maintenance of Dodger Stadium, an L.A. icon. “October 7 (1957) was Los Angeles’s day of decision. Any chance of attracting the Dodgers hinged on ten yes votes. Five no’s would kill the contract and keep the team in Brooklyn, at least for the time being. (Los Angeles Councilmember John) Holland’s strategy that day was a filibuster. He read a lengthy series of statements into the record in the hope of dragging the proceedings into adjournment. A no decision was effectively a decision to reject. Holland had three committed negative votes in addition to his own, so his side was one vote short. As he droned on, spectators arrayed on either side of the council gallery according to their positions on the contract cheered and heckled. The meeting, broadcast live on television, brought the city to a virtual standstill as the drama played out. Although he did not see it in person, Walter O’Malley was of course following the council session with great interest. He was in Milwaukee on October 7, in attendance at County Stadium as the Braves played the Yankees in Game 5 of the World Series. There was much irony in this setting. The Milwaukee ballpark was one of the major reasons O’Malley was on the verge of moving the Dodgers. The deal the Braves had received to play in County Stadium in 1953 had made O’Malley fear for the future of his team and lent his quest for a new ballpark in Brooklyn much of its urgency. Now he sat in County Stadium watching the sum of his fears play out, as the young Braves, having bested his aging Dodger roster for the 1957 National League pennant, defeated the Yankees 1-0 to take a three-games-to-two lead in the World Series. Three days later, they would become world champions. If O’Malley mused about what had brought him to this day of reckoning, the scene on the field at County Stadium would remind him. By the time the game ended, it was early afternoon in Los Angeles. O’Malley flew from Milwaukee back to New York while the council meeting continued. As it dragged into the evening hours, O’Malley arrived at his home in Amityville still unsure of his final destination. In Los Angeles a nervous (Mayor Norris) Poulson pulled (Councilmember Rosalind) Wyman off the council chamber floor to confer in his office. Twelve of the fourteen votes were set, eight in favor of the contract and four opposed. Two wavered, including Karl Rundberg, whose support for the contract was particularly tenuous. O’Malley and the council now resembled romantic suitors, skittishly probing the other’s intentions. Poulson and Wyman knew that the undecided council members would benefit from O’Malley’s unequivocal declaration that he would formally accept the contract if it was approved. Poulson begged Wyman to call O’Malley to get this commitment. When they reached him in Amityville, she pressed him for a definitive answer. Even at this late hour, O’Malley could not offer it. He had already compromised his negotiating position by renouncing half of the oil and mineral rights at Chavez Ravine and promising to construct a public recreation area on a portion of the land and pay for its upkeep for twenty years. But there was more to his hesitation than a desire to drive a better bargain. Now that he was on the precipice, did he really want to jump? With the exception of his years at Culver Military Academy in Indiana and the University of Pennsylvania, he had never lived anywhere but New York. Despite his interactions with Los Angeles’s public officials over the preceding two years, he was strikingly unfamiliar with the city. O’Malley had not set foot in Los Angeles until October 1956, and the total of three trips to the city came to about ten days. He and Rosalind Wyman, with whom he was discussing the future of his professional and personal life, had never met in person. Who were these Los Angeles politicians, with their expansive promises and glib beguilements? Did he really know them? Could they be trusted? What of John Holland, the contract’s chief opponent on the City Council? How many other public officials also believed that the Dodger Stadium project failed to rise to the level of a public purpose? How many ordinary citizens shared their views? What was the political terrain in Los Angeles like? Was there a Robert Moses in the city, an unelected power broker who could crush his plans on a whim? O’Malley had promised to build the new stadium with his own money. He would clearly have to borrow to do so. Could he get financing? And where would he play in 1958? Wrigley Field was even smaller than Ebbets Field, and the Los Angeles Memorial Coliseum and Pasadena Rose Bowl were massive football stadiums. Inadequate as Ebbets Field might have been, he knew he could open the 1958 season there if he chose, just as he had in years past. There was also the matter of New York itself. Did O’Malley really want to relinquish the most important city in the nation and his sport’s largest market? A mayoral election loomed in a month. Every elected New York City official, including the City Council president, the controller, all five borough presidents, and the entire council, would face the voters on November 5. If O’Malley chose to make the inaction and disorganization of these officials a campaign issue, would enough voters pressure enough politicians worried about keeping their jobs to come up with an acceptable stadium deal? Did he wish to take a chance on this, going around Robert Moses, directly to the people of New York? Wherever O’Malley looked, in fact, he was taking a chance. And as far as Los Angeles was concerned, he had run out of time. Over the course of the preceding ten years, he had made his goals clear; a privately constructed stadium built on affordable land, preferably located in Brooklyn. His agenda was no different on October 7, 1957, than it had been on October 7, 1947; only the means to his desired ends were unclear. This accounts for the speculation that has swirled around O’Malley’s “true” motives. It is tempting to reason backward from an outcome we already know, to trace what appears to be a road of inevitability leading toward it. Viewing O’Malley’s actions in this way, one might argue that he planned to move to Los Angeles all along, since we know that he eventually arrived there. But events and the emotions that drive them are much less determined than we believe. Life courses swing on hinges, contingent and uncertain. Walter O’Malley knew what he wanted but not how to get it. This could have led him down any number of paths, including one that circled back to New York, right up to the moment of his conversation with Rosalind Wyman on the evening of October 7, 1957. To argue otherwise reduces history to a series of certitudes at odds with the vagaries of circumstance and experience. Assuming that O’Malley had planned in secret to move to Los Angeles years in advance and that his negotiation with New York were thus a sham accords him substantially more influence over events and individuals than he possessed. If O’Malley’s ambiguous exchange with Wyman proves anything, it is this. O’Malley understood that in Vin Scully, he possessed not only one of the very best play-by-play announcers in the game but a peerless marketer for Dodger baseball in Los Angeles. Scully was a native New Yorker who had become a team broadcaster in 1950, only one year out of Fordham University. When Dodger lead announcer Red Barber left for the Yankees after the 1953 season, Scully took over as the primary voice of the team. A gifted storyteller with an unsurpassed ability to paint a word picture with his voice, Scully was perfect for baseball on the radio. By the time the Dodgers left Brooklyn he was as closely identified with the team as any of the players, a trusted source of news, insight, and entertainment. Indeed, to many fans, Scully was the Dodgers. Scully came to Los Angeles at the urging of O’Malley, who would need him to connect the team with its new audience. Los Angeles, unlike New York, was a city built around the automobile, magnifying the importance of radio to drivers trapped on crowded freeways…. O’Malley made another broadcasting decision that would have major long-term ramifications for his team. Los Angeles’s Latino population represented a huge potential market for the Dodgers. Baseball had deep roots in the Mexican American community, with neighborhood leagues serving both to cement social bonds and to showcase the talents of sandlot players. O’Malley was also concerned about the ongoing effects of the looming Chavez Ravine eviction controversy. Although not responsible for its genesis – he had, of course, been in New York when the original notices to vacate went out (seven years earlier) – O’Malley knew he would be associated with the ultimate outcome of the dispute. He decided that Spanish-language broadcasts of Dodger games were essential to the success of the franchise in Los Angeles, and he instituted them for the 1958 season. In 1959, O’Malley hired Jaime Jarrin, a local radio sports reporter and a native of Ecuador, to do play-by-play over station KWKW. Jarrin, a vivid wordsmith whose dramatic calls made him the most recognizable and beloved “Dodger” in the city’s Latino neighborhoods, would become the Spanish-language counterpart to the English-speaking Scully. Like Scully, Jarrin’s career in the team’s broadcasting booth would span more than half a century. O’Malley was not oblivious to issues of racial justice, and while credit for Jackie Robinson in 1945 had gone almost exclusively to Branch Rickey, the hiring of Jaime Jarrin was O’Malley’s idea alone. The origination of Spanish-language Dodger broadcasts not only made O’Malley a racial pioneer but also bound his team to the Latino community of Los Angeles. The developing crisis over the Chavez Ravine squatters would strain those bonds, but thanks in large part to Jarrin they never broke. O’Malley had sought to keep a low profile during the eviction process, not commenting in the media and concentrating on preparations for the (Roy) Campanella tribute game (on May 7, 1959). Dodger personnel played no direct role in carrying out the evictions. The land condemnations had been upheld in the courts, as had the Dodgers’ acquisition of the land itself. Even (Councilmember Ed) Roybal did not claim that O’Malley had taken Chavez Ravine or the (Manuel) Arechiga property in an illegal manner. But O’Malley and the Dodgers would be associated with the televised images of the forcible removals, with Arechiga family members being carried down flights of stairs and bulldozers leveling cherished homes that had stood for generations. O’Malley had not personally destroyed the Chavez Ravine community. That process had been set in motion long before he paid his first visit to the area in May 1957. Nonetheless, as the beneficiaries of the evictions, O’Malley and his ball club would henceforth be viewed by many in the city’s Latino populations as agents of the Ravine’s destruction. The city of Los Angeles, not the Los Angeles Dodgers, destroyed Chavez Ravine. But the passage of time often clouds perceptions of cause and effect and compress chronologies of events. It is easier and simpler to say “the Dodgers evicted the Arechigas in May 1959” than “the Arechiga property was condemned by the city in 1951 for public housing that was never built and the family finally evicted in 1959 after the land had been transferred by the city to the Los Angeles Dodgers for use as the site of a new ballpark.” O’Malley and the Dodgers have gone through history as the engineers of the Arechigas’ evictions. This is unfair, as are imputations of anti-Latino prejudice directed at the Dodger owner. O’Malley’s was a businessman’s mind. He viewed Mexican Americans as potential customers, not as a hostile constituency. There is no evidence that he harbored special prejudices against them, and he certainly did not set out to evict the Arechigas from Chavez Ravine based on their ethnic identity. But simple myths often endure longer than complex truths. The Times linked support for the Arechigas with opposition to progress in Los Angeles and with parochial self-interest at the expense of the common good. The existence of the eleven Arechiga homes allowed the Times to change the terms of argument, from whether transferring property between one private owner and another was legal to whether Los Angeles would be a city with influence and prestige commensurate with its size. Phrased in this manner, the argument was almost impossible to lose. The media reports of the Arechigas’ other homes swung public opinion sharply against the family. In the process, opponents of the stadium project lost credibility through their association with this issue. Almost overnight the response to the evictions of the Arechigas went from “a disgrace to the city of Los Angeles” (May 12, the day before the Mirror News story appeared) to “what a jerk you (Roybal) turned out to be, defending people who like to make a sucker out of you and Holland. This will teach you not to stand in the way of progress” (May 13). The job Jack Yount of Vinnell Constructors began just after Labor Day 1960 was one of immense proportions. He had already excavated 2 million square yards of dirt from Chavez Ravine in order to grade the future stadium’s land. Now he would be tasked with moving 5.5 million more yards in order to create the “bowl” in which the ballpark could be sited. He would also have to pave the 300 acres of land on which Dodger Stadium, its parking areas, and the recreation area would be built. On Yount’s advice, O’Malley paid an additional $1.50 a cubic yard for special lightweight, high-strength concrete that was stronger even than that used for highway bridges. There would be approximately 45,000 yards of concrete used in total. The 23,000 concrete pieces, all precast, were numbered and assembled in a preplanned order. Dirt excavation proved more complicated than anticipated, and three months were lost solidifying the structural foundation before the first concrete pieces could be installed. In a unique arrangement, Yount built a casting yard on-site to accommodate the size and weight of the concrete blocks, which could not be transported long distances. A specially built crane placed the blocks in their designated spaces. By early 1961 the basic form of the stadium skeleton was visible from the air. Sunken into the ground, it could not be appreciated horizontally. Using cantilevers, curved steel beams that could bear heavy weights without external support, all stadium decks would offer unobstructed views. This was probably the most important departure from the architecture of the traditional stadiums of the East and Midwest and the single most significant change from a fan’s standpoint…. O’Malley had waited for decades for the chance to build his own stadium. Now he made the most of his opportunity, involving himself in virtually every aspect of its planning and effectively acting as an architect without formal portfolio. Early on he understood the potential of the Chavez Ravine site, with its downtown and mountain vistas…. O’Malley truly made Dodger Stadium his own creation. Nothing was too small to escape his attention. He consulted with (engineer Capt. Emil) Praeger on the wood used in the stadium seats. He cautioned against building the pitcher’s mound too high, since it would block views from some box seats. He insisted that stadium deck facades be built at slight upward angles so that foul balls would not bounce directly down on patrons sitting below. He asked for auxiliary scoreboards to be installed on the grandstand for the convenience of pavilion spectators who would be seated below and in front of the two main boards…. He intended that the act of attending Dodger Stadium would be as important as the outcome of the game played there. There would be, as one observer put it, “a dispassionate accent on Dodger Stadium and the larger experience rather than on the Dodgers and how they (were) doing.” While there would be more and less expensive tickets, O’Malley was determined to offer every customer the same enjoyable basics. This meant fans on the top stadium deck would be the beneficiaries of low ticket prices (general admission was only $1.50), beautiful mountain and skyline vistas, unimpeded bird’s-eye views of the field, and high-quality, inexpensive concessions. The stadium scoreboards would also build on the atmosphere of spectacle and entertainment. They would be the largest and most technologically sophisticated in American sports history. 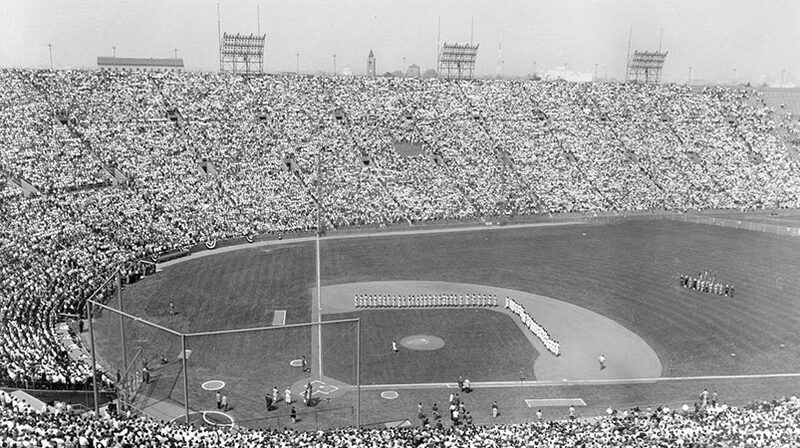 Dodger Stadium made downtown Los Angeles possible. Downtown Los Angeles in turn made modern Los Angeles possible. There were, to be sure, other civic undertakings crucial to its growth. The Los Angeles Aqueduct gave the city its lifeblood – water—in 1913. City Hall, erected in 1928, offered a tangible locus of power projecting outward from the central core, as well as an iconic symbol of the city itself. The Los Angeles Memorial Coliseum, completed in 1923 and home to the 1932 Olympic Games, announced the city to the world. In 1939, with the opening of Union Station, Los Angeles had a transportation hub that connected it to regional and national networks of commerce and social movement. But even as these structures took shape, Los Angeles’s downtown declined. By 1957, when the Dodgers arrived, downtown was a place in which thousands of Angelenos worked by day and from which they fled at night. Retail trade was declining and property values stagnating. Even Union Station – which itself could have been described as an “embark-and-flee” entrepot – had not affected this state of affairs appreciably. Downtown Los Angeles appeared much the same as it did in 1939, when Union Station was completed. But it became a very different place in the wake of Dodger Stadium’s opening in 1962. The stadium began the process of change that created Los Angeles’s modern downtown. It foregrounded everything that came afterward. By the 1990s, downtown Los Angeles was almost unrecognizable, no longer the drab collection of low-rises that had defined it four decades earlier. 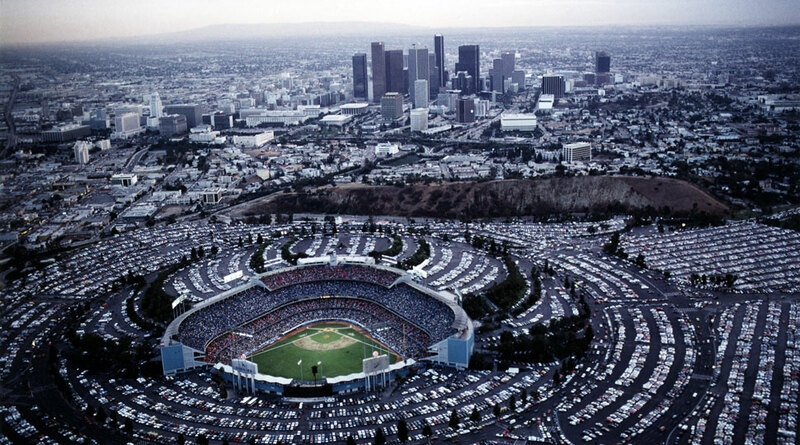 Dodger Stadium was the gateway that transformed downtown and created a modern Los Angeles. 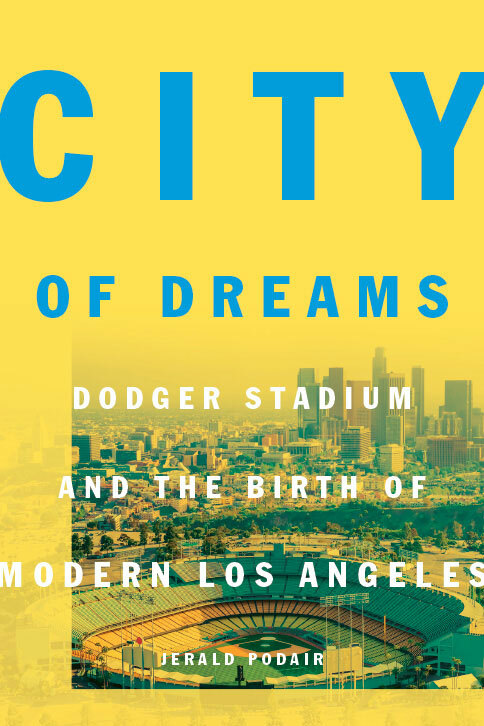 Excerpted from CITY OF DREAMS: Dodger Stadium and the Birth of Modern Los Angeles by Jerald Podair. Copyright © 2017 by Princeton University Press. Reprinted by permission. Jerald Podair is professor of history and Robert S. French Professor of American Studies at Lawrence University. He is a native New Yorker, who received his undergraduate degree from New York University, a law degree from Columbia University, and a Ph.D. in history from Princeton University. He is the author of The Strike That Changed New York: Blacks, Whites, and the Ocean Hill Brownsville Crisis and Bayard Rustin: American Dreamer. He also co-edits The Routledge History of the 20th Century United States. 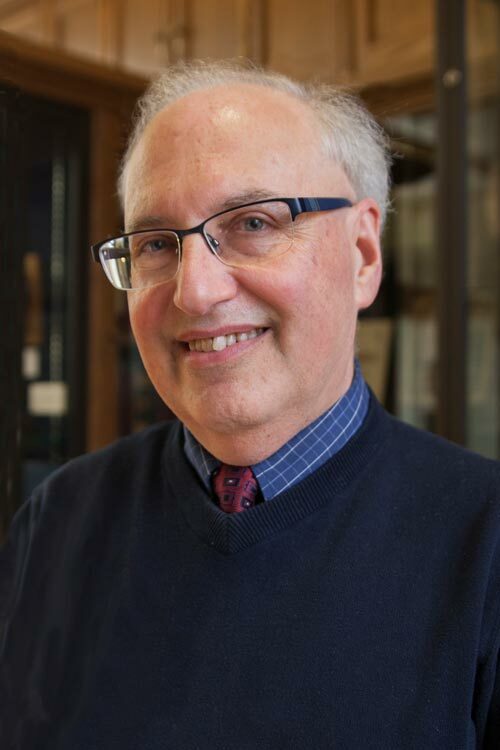 He received the Society of American Historians’ Allan Nevins Prize for “literary distinction in the writing of history” and Lawrence University’s Award for Excellence in Scholarship. He is also a Fellow of the New York Academy of History. His most recent book is City of Dreams: Dodger Stadium and the Birth of Modern Los Angeles, published by Princeton University Press. Jerald Podair’s “City of Dreams: Dodger Stadium and the Birth of Modern Los Angeles” has been named winner of the Society for American Baseball Research’s 2018 Seymour Medal. “City of Dreams” is thus recognized as the best baseball history book for the preceding calendar year. The award was started in 1996 as a way of recognizing the best in original research and writing about baseball history. Podair is set to receive the Dr. Harold and Dorothy Seymour Medal at the banquet of the 25th annual NINE Spring Training Conference on March 3 in Tempe, Arizona. Podair’s book was also recognized as a finalist in the 2018 Pen America Literary Awards, which are “juried by panels of esteemed, award-winning writers, editors, booksellers, and critics.” Out of scores of non-fiction sports books in 2017, Podair’s “City of Dreams” made the short list of five finalists in January 2018 for the Pen/ESPN Award for Literary Sports Writing.